Excellent car maintenance is not only limited to the internal workings of your car. While maintaining your fluids and getting regular tune-ups should be routine, taking proper care of the exterior of your vehicle is just as important as taking care of what’s under the hood. Ultimately, how often you wash your car depends on several factors, including where you store you car, the weather and environment, and even your commute. There are many benefits to keeping your car clean. Proper car washing removes contaminants such as tree sap, salt, dust, pollen, bird droppings, bug splatter and air pollutants. These contaminants are damaging to the paint and finish job on your car and keeping them on the car too long can lead to faded paint, rust and corrosion, ugly stains, chipped paint and discoloration. If you park your car outside, where it is exposed to bugs and the elements, or park underneath a tree where bird drippings and tree sap can fall onto the car, then you may consider washing your car once or twice a week to protect your paint and finish and prevent staining and discoloration. Tree sap and bird droppings are harmful since they can cause your paint to chip and even corrode the paint if they are left on the car too long. Too much exposure to heat may also accelerate these issues; consider it as if you’re baking these things onto your car. Rain is not a guarantee of your car being clean either because rain water may trap contaminants on your car and induces rusting and if you live in an area that experiences acid rain due to heavy pollution, that will do more harm than good to your car. Additionally, if you drive long distances on a regular basis, weekly cleaning of your car will remove much of the above mentioned that you encounter on your commute. 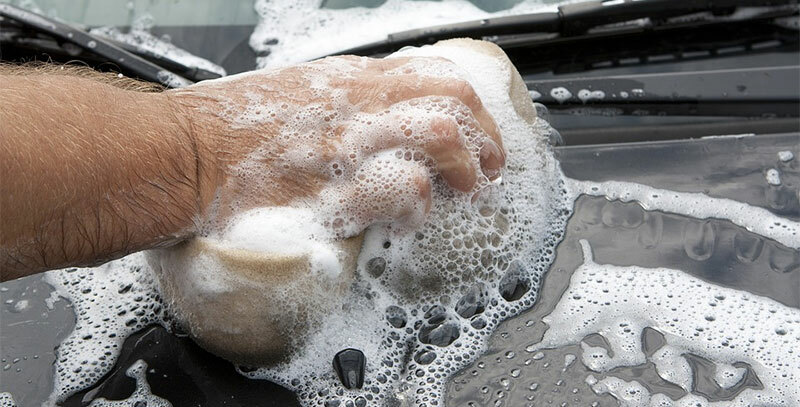 Finally, if you are concerned about the resale value of your vehicle, then regular washing will keep the car looking as good as it did the day you drove it off the lot. If you’re looking for the general rule of thumb here, then you should know that the experts recommend giving your automobile a wash every two weeks. And yes, that is all year long. Of course, other factors may mean that you should do it less or more than that. Those who park their cars in a garage and keep them stored more than they drive them and those who live in areas of mild weather will benefit from washing their car once or twice a month to keep the paint up, as there is limited exposure to the elements and other pollutants. If you live near or visit the beach occasionally, where there is a higher concentration of salt in the air, washing your car once a week, especially the undercarriage will help prevent premature rusting. And yes, you should wash it more often in the winter since you end up with road salt on the car from driving on those winter roads. Of course, if you’re not regularly driving your vehicle, then you may be able to keep to your normal washing schedule. If you’re already taking the time to clean the outside of your car, then it only makes sense to clean out the inside of it at the same time. Sure, you’re not getting tree zap or bird poop inside the car, but it still gets dirty from other types of debris. This is especially true if you have pets or young children in the vehicle. You can use a vacuum with a hose to clean up the floors and the seat crevices. And yeah, you’ll probably find some old french fries if your vehicle is anything like mine. If you come across any spots or stains on the seats, then you should clean them up as well with an upholstery cleaner. Depending on if you have fabric or leather seats, you can find the proper cleaning agent to use on it. And remember that you should use a leather conditioner every three months on those leather seats. Also remember that you can take the vehicle to get it detailed so that the inside ends up as clean as the day you drove it off the lot. The experts recommend that you give your vehicle a good waxing at least twice a year. And yes, the vehicle’s exterior should be clean before you wax it. Make car washing a regular part of your car maintenance routine. Take the time to assess your needs based on how you store you car, the environment you keep it in and the other factors mentioned above. Much like your engine and transmission, the exterior of your car is an important feature, especially if you are concerned about the resale value of your vehicle. Whether you wash your car yourself with a good soap or take it to a car wash, the goal of washing your car is to keep the paint fresh and blemish free. And don’t forget to wax your car after you get it clean! That’s really cool that proper car washing removes contaminants like tree sap, salt, dust, pollen, bird droppings, bug splatter, and air pollutants. I’ve heard that if you wash your car at least 2 times a month, you make it so that the paint on your car’s exterior will last up to at least 5 years longer. That’s a good reason to wash it! I’ll have to keep this information in mind as I just got a new car and want to keep it in good shape!